The Nissan Rogue is a compact crossover SUV that is produced by Nissan. It made its debut on the car market in October 2007 and was for sale in the 2008 model year. There are two generations of the Nissan Rogue and the second generation, launched in 2013, is Nissan’s best-selling vehicle in the United States. The Rogue comes standard with front-wheel drive, costs less than the Nissan’s crossover SUV the Morano, has only slightly less passenger room than its V6 sibling, and an almost equal cargo space area of 39.3 CU ft. As the Rogue moved into its second-generation model, the first generation remained in production from 2013-2015 as the Rogue Select. With its first release, customers saw the Nissan rogue come in three trims in the United States: S, SV, and SL. S is the base model, which comes factory equipped with anti-lock brakes, air conditioning, cruise control, power windows, locks, and mirrors, remote keyless entry, and AM/FM/CD stereo with four speakers and auxiliary input jack. An optional package upgrade on the S model adds 16-inch alloy wheels, Auto-dimming rear-view mirror with rear-view monitor, body color rear spoiler, chrome grille, and rear privacy glass. An S Krom trim edition includes Krom integrated body design, center-exit exhaust, body color rear spoiler, 17-alloy wheels, and rear privacy glass. Impressive safety features were included from the very beginning of production of the Rogue, making a used Rogue a great option even in the earlier years. Included safety features were front, side-impact, and side-curtain airbags with rollover sensors, tire pressure monitor, ABS with brake assist and electronic brake-force distribution, traction control, and anti-skid control. The Nissan Rogue received high scores in the National Highway Traffic Safety Administration (NHTSA) right from the very beginning. Throughout its first generation, the Nissan Rogue received several awards including the 2010 Consumer’s Digest Automotive Best Buy Award and the US National Highway Traffic Safety Administration Highest side-impact safety rating (five stars). In 2011, a model update included redesigned gauges recolored from orange to black, redesigned center dash for the addition of the navigation system, redesigned exterior including a new front fascia and grille, new front and rear spoilers, new chrome side door molding trim accents, new front and rear tire deflectors and a new chrome license plate finisher. The Rogue S Krom Edition and the SL package had new low rolling resistance tires, available with 17-inch alloy wheels, and a new underbody cover. The Rogue S Krom Edition is a version of Rogue S with sportier styling, a sport-tuned exhaust, 18-inch polished wheels and tires, a unique grille and bumper with fog lamps, and other styling additions. The vehicle was revealed at the 23rd Annual International Z Car Convention in Nashville. Models went on sale in the U.S August 2013. With a used Nissan Rogue from this year, you would find the SV with an available SL package, adding leather seats, touchscreen navigation system and 18” alloy wheels, and a few other premium features. The 2010 Nissan Rogue saw changes such as new aluminum-alloy wheels design, a sport mode to the CVT, one new exterior color, graphite blue, and an around view monitor that created a composite top-view of the SUV’s surroundings and shows it on an LCD monitor inside the vehicle. The “Special Edition” replaced the Krom Edition, and added 16-inch alloy wheels, a high-end audio system, satellite radio, privacy glass, a rear-view monitor and fog lamps to the S trim. Changes to the second-generation Nissan Rogue were inspired by a version of the Nissan X-trail and the Hi-Cross Concept to adapt to the US and Canada Markets. Some changes on a used Nissan Rogue from this year would include optional third-row 7 passenger seating, standard 4-wheel independent suspension, electric power-assisted steering, 4-wheel disc-brakes with an anti-lock braking system. This 2013 second-generation was first shown to the public at the Frankfurt motor show and US models went on sale in November of 2013 as a 2014 model. Early models included a 2.5 L 4-cylinder engine. This second-generation was available in 3 trims: S, SV, and SL, each in a choice of front-wheel or all-wheel drive. 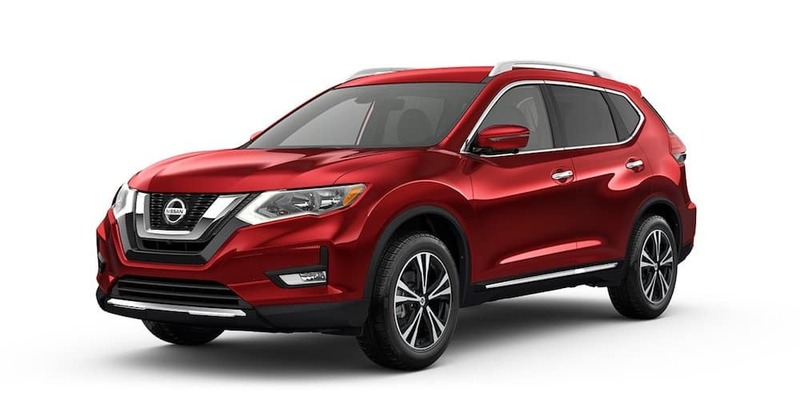 You will find used Nissan Rogues from 2016 equipped with technology like NissanConnect with Navigation, Siri Eyes Free, and many other new features, including eight exterior colors. The 2017 was restyled with new head and tail lights, with LED running lights standard on all trim levels. Also in 2017, a hybrid version of the Nissan Rogue hit the market. This hybrid was only available for the 2017 model year and came in two trim levels, SV and SL, it was not available with 3rd-row seating. The Nissan Rogue has been in its second generation since 2013. Changes from the first generation include an optional 3rd-row seating for 7 passengers, standard 4-wheel independent suspension, electric power-assisted steering, 4-wheel disc brakes with an anti-lock braking system, and an interior space that is similar in size to the Nissan Murano, Altima, and Maxima. The Rogue is currently holding the top pick for safety in HIS ratings. It carries over features from the first generation and adds in lane departure warning, frontal collision warning, object detection warning (SL Trim Only), and a 360-degree backup camera. In 2017, the Rogue received an impressive style upgrade with restyled headlights and taillights, and LED daytime running lights standard on all trim levels. The most recent model for 2018 added in automatic emergency braking, while blind spot warning and rear cross traffic alert became standard safety features. Performance features on the 2018 Nissan Rogue include available propilot assist, intelligent cruise control, standard class-exclusive easy-fill tire alert, available remote engine start, available motion-activated liftgate, standard halogen headlights with auto-off function, and standard LED taillights and daytime running lights. The current 2018 model Nissan Rogue has an MSRP of $24,800. McCluskey Auto is pleased to serve the Cincinnati, OH area. We offer a huge used car selection from a wide variety of brands, models, and makes. We offer high-quality used vehicles that are low-mileage, affordably priced, and recent model years. We are also happy to provide our customers and potential customers with on the spot financing and lifetime powertrain warranties for vehicles purchased. At McCluskey, we can find any vehicle that you are looking for at the lowest price possible with our nationwide vehicle search. Looking for ease of purchase? McCluskey Auto is a one-stop shop for shopping and purchase as we offer in-house financing. We can help anyone get into a safe, dependable, affordable vehicle – no matter what their credit rating. Stop into McCluskey Auto today and see how we can help you!